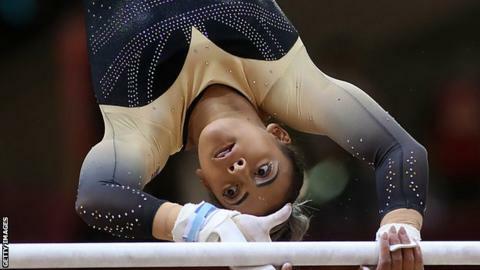 Ellie Downie and James Hall claimed the women's and men's senior all-around titles at the British Gymnastic Championships in Liverpool. Downie, who has had two ankle surgeries, came from behind to claim victory with a score of 56.0 from the four apparatus. Commonwealth all-around bronze medallist Hall dominated the men's event, winning with a 84.85 score. Two-time Olympic gold medallist Max Whitlock won the senior pommel title. The 26-year-old was watched by his wife Leah and their three-week-old daughter Willow. "Before the competition I was sterilising bottles and packing the changing bag," Whitlock said. "If she can be my little cheerleader that would be absolutely fantastic." Whitlock will compete in the masters pommel final on Sunday along with the eight best under-18s and senior competitors. Nineteen-year-old Downie missed the Commonwealth Games in 2018 to undergo a second procedure on her left ankle. "This is the first time that I have managed to bring all my skills together at a competition, so I am just chuffed it went so well," she added.